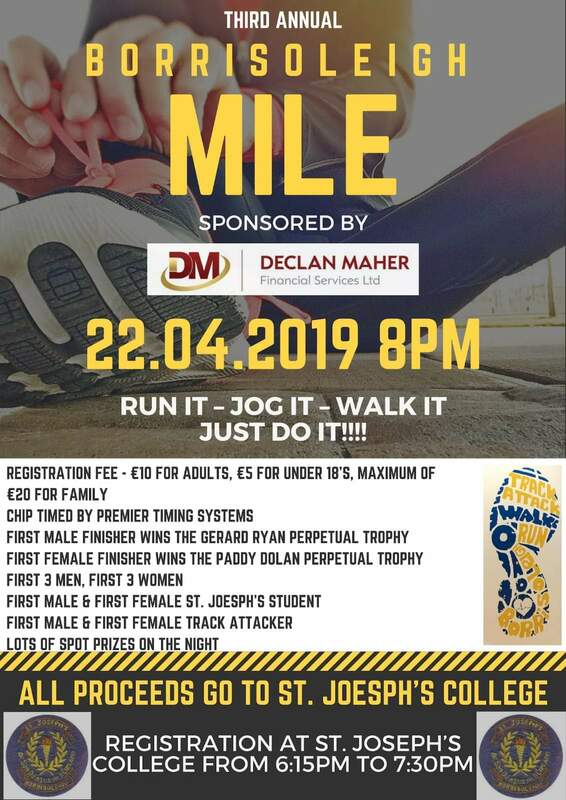 The third annual Borrisoleigh Mile which is sponsored by Declan Maher Financial Services hits the North Tipperary village on Easter Monday night next when participants of all age and ability will congregate to attempt the golden distance. The event originated back in the 1960’s when it was part of a parochial sports day that was held in Treacy’s Field in Fantane. In 2017 after an absence of 48 years, the local Track-Attack club decided to bring back the event and in doing so pay tribute and acknowledge the work that two great stalwarts of Tipperary athletes did over many decades. 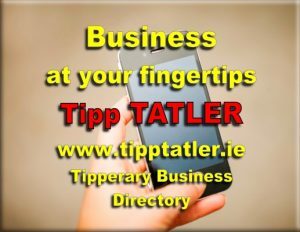 Ger Ryan and Paddy Dolan spent many years promoting and organising many events within the Tipperary athletics scene at a time when the advantages of computers and social media were not on the radar. On Monday night next Ger will be on hand to present the Gerard Ryan Perpetual Trophy to the first man who crosses the finish line and get their name etched beside Liam Harty of the Gardaí Club and Tom Hennessy of Nenagh Olympic. Paddy will present the Paddy Dolan Perpetual Trophy to the first woman who finishes and she will be following in the footsteps of Carmel Fitzgibbon of Thurles Crokes and Susan Murnane of Limerick A/C. Like last year, Track-Attack will again be teaming up with St. Joseph’s College and all proceeds raised on the night will be going towards the Borrisoleigh School. Entries will be taken in St. Joseph’s from 6:15pm to 7:30pm on Monday evening. 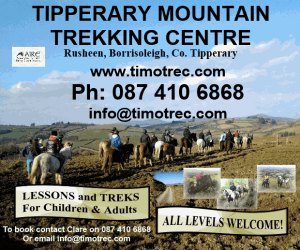 Participants need to remember that they need to get themselves to the start line which is one mile out the Thurles road from the village square. The entry fee on the night is €10 for adults and €5 for Under 18’s. The event will be chip timed by Premier Timing Systems. The first 3 men and women will be presented with hand crafted Irish slate trophies, designed and manufactured by Christy Slattery of Latteragh Crafts. Every 25th finisher will receive a Borrisoleigh Mile Mug which were designed and manufactured by Noel Cahill of Mr. Sports Gift. There will also have a draw amongst finishers for Easter Eggs which were all sponsored by members of the Track-Attack Club.